Whilst peace, integration, cooperation and development remained the prevailing trend in 2017, the world witnessed growing secessionist movements across some regions, international organizations, countries and such increasingly complicated hotspots as the Korean Peninsula, the Middle East. Though a superficial glance suggested that a cooling down period was truly at play in the South China Sea, a deeper look pointed to latent tensions. Against this backdrop, our diplomacy and international integration achieved outstanding results, reaching the goal defined by the Party, the State and the Government of “safeguarding the nation’s supreme interests, preserving an environment of peace and stability and maximizing external resources for the country’s development”. International military integration and defense diplomacy had a role to play in those outstanding results. The Ministry of National Defense proactively drafted strategic documents, including the Project on “International military integration until 2020 and vision till 2030” (hereinafter the Project), offered sound advice to the Party and the State on guidelines and strategies concerning international military integration and defense diplomacy, thereby flexibly, resolutely and effectively coping with complicated land border/sea-related issues to avoid conflicts and confrontation, contributing to preserving the country’s independence, sovereignty and territorial integrity. Bilateral defense cooperation became further deepened and more substantive to satisfy Vietnam’s strategic interests, to greatly contribute to bolstering confidence and friendship between Vietnam and its partners, and to maximize widespread international support. Border defense diplomacy presented a bright spot in the overall picture of Vietnam’s international military integration and defense diplomacy, contributing to firmly safeguarding national security and territorial integrity and maintaining peace for the country’s development. Participating in multilateral defense diplomacy activities, regional security structures and the UN Peacekeeping Operations, Vietnam presented itself as a responsible member of the international community. The Ministry of National Defense effectively carried out cooperative programs and projects on war legacy issues and disaster relief, greatly contributing to the country’s socio-economic development. International cooperation was fostered in the realm of defense economics, military trade, defense industry, contributing to expanding the country’s defense capabilities. The international community spoke highly of the fact that Vietnam received Chinese President Xi Jinping on his first overseas trip since the 19th National Congress of the Communist Party of China and US President Donald Trump on his first trip to the country in the very beginning of his term in office. The US and Chinese Presidents’ visits to Hanoi and talks with Vietnamese leaders on the same day reflected the two major powers’ regard for Vietnam, raising the country’s status in the international status. Defense diplomacy was one of the factors in the success of the momentous event. International military integration and defense diplomacy in 2017 was regarded by the Party and State leaders as a bright spot of the military, one of the pillars in consolidating Vietnam’s relations with its neighbors, major powers, ASEAN member states and other countries, and an effective channel to contribute to safeguarding national interests and raising the country and military’s status in the international arena. This lays an important foundation for the military to embark on the year 2018 with intertwined new opportunities and challenges. Peace, national independence, democracy, cooperation and development is expected to remain the prevailing trend in 2018. The 4th Industrial Revolution with its unprecedented scale and pace will have far-reaching impacts on all fronts. Major powers’ adjustments in their foreign policies and secessionist movements will profoundly influence the global, regional political-security complexion and international relations. The Indo-Pacific region will witness a more multilateral complexion with stiffer competition among major powers, which will have ensuing implications for developed countries, including Vietnam. The year 2018, which is instrumental in the implementation of the Resolution of the 12th Party National Congress, marks significant milestones such as 5 years of implementing the Resolution of the 11th Party Central Committee’s 8th Plenum on the “Strategy for Homeland protection in the new situation” and the Resolution 22-NQ/TW dated April 10th, 2013 by the Politburo (the 11th tenure) on international integration. Meanwhile, this is the third year of implementing the Resolution of the 10th Army Party Congress, the fifth year of implementing Resolution 806-NQ/QUTW, dated December 31st, 2013 by the Central Military Commission on “International military integration and defense diplomacy until 2020 and beyond”, and the first year of implementing the Project, which sets out more demanding requirements for international military integration and defense diplomacy – an important front for Homeland safeguarding in peacetime. In order to make the best use of opportunities and defy all the odds, steps to be taken by international military integration and defense diplomacy should be as follows. First, thoroughly reviewing the implementation of resolutions on international military integration and defense diplomacy in line with plans by the Politburo, the Party Central Committee's Secretariat and the Central Military Commission. The review should be objective, comprehensive and substantive in order to identify shortcomings to be redressed, draw lessons to be learnt, and propose adjustments to be made in the coming time. The greatest lesson to be learnt is to adhere rigidly to the foreign policy by the Party of independence, self-reliance, peace, cooperation, development, multilateralization and diversification of foreign relations, and proactive international integration, to creatively apply Ho Chi Minh’s thought and art of diplomacy, especially his thinking on independence, self-reliance when it comes to diplomatic activities. The country’s capabilities and strength should be thoroughly grasped vis-à-vis its relations with major powers in accordance with President Ho Chi Minh’s teachings: “It should be noted that if we are strong enough, others will pay regard for us. Otherwise, they, even our allies, just take us as a tool”. The country attributes its strength mostly to internal solidarity and unity, and socio-political, defense and security stability. The Party’s guidelines and Ho Chi Minh Thought lays a foundation for our being “firm in objectives, flexible in strategies and tactics” amidst increasingly complicated developments in the region and the world. On this basis, education should be promoted to raise awareness and sense of responsibility vis-à-vis international military integration and defense diplomacy as an important, regular task of the Central Military Commission, the Ministry of National Defense and the whole military. Second, enhancing the Party’s leadership and the State management while promoting the roles of the Central Military Commission and the Ministry of National Defense to improve the quality and effectiveness of international military integration and defense diplomacy in the new situation. Leadership and direction should focus on goals, tasks and solutions concerning international military integration and defense diplomacy defined in resolutions and strategies by the Politburo, the Government and the Central Military Commission, under the motto of “activeness, proactiveness, firmness, flexibility, effectiveness”. Plans and a time limit should be formulated and set respectively to implement the Project in line with capabilities and demands of the country and the military, cooperation and development trends in the region and the world, to ensure accountability for agencies and units across the entire military. The Ministry of National Defense’s Steering Committee on international integration (also known as the Steering Committee 806) should be consolidated while the management should be enhanced of international cooperation activities by agencies and units across the entire military. The organizational structure should be strengthened for military agencies specializing in foreign affairs and international military cooperation, especially the Department of External Relations and the Vietnam Peacekeeping Department, to meet the requirements of international integration in the new situation. Close cooperation with affiliates of the National Assembly and the Government (such as the Ministry of Justice, the Ministry of Foreign Affairs) is needed in perfecting policies and legal normative documents concerning international military integration and defense diplomacy. The Ministry of National Defense should soon submit to the Government for approval a draft decree on amendments to Decree No. 104/2012/ND-CP on foreign military ships’ entry to the Socialist Republic of Vietnam and a draft circular providing detailed guidelines on how to implement the Government’s Decree.22/2016/NĐ-CP on defense diplomacy. Moreover, it should actively draw up legal documents concerning Vietnam’s participation in the UN peacekeeping operations and propose mechanisms for cooperating with central agencies in exchange of information, strategic predictions and advice. Military agencies and units should thoroughly grasp the situation and adjustments in strategies and policies of partners, particularly major powers and neighboring countries while conducting comprehensive studies to make accurate predictions and to offer sound advice to the Party and the State on the defense strategy, thereby properly handling land border/sea-related issues and sensitive issues in international relations, avoiding being plunged into passivity or being engaged in the complicated competition between major powers. Third, continuing to deepen bilateral defense cooperation with priority assigned to neighboring countries, major powers, ASEAN member states and traditional friends by boosting strategic trust, stepping up the exchange of high-ranking delegations, fostering cooperation in building, managing and safeguarding shared borders of peace and friendship, improving the effectiveness of mechanisms for the prevention and control of instability and conflicts. It is important to promote cooperation in education and training as well as studies and predictions for global geopolitics and defense strategies while including foreign languages in military schools’ curricula. As regards cooperation in military science and technology and defense industry, it is essential to regularly attend international defense trade shows and exhibitions, to gradually shift from arms procurement to technology transfer and to call for the foreign aid of used military equipment of good quality that matches Vietnam. Cooperative projects for the Navy and the Coast Guard should be developed and undertaken whereby joint search-and-rescue exercises will become part of measures to boost bilateral relations, to consolidate peace and to expand military units’ capabilities. Fourth, taking multilateral cooperation within ASEAN as the cornerstone of defense diplomacy while actively participating in regional fora, conferences and joint activities. It is necessary to proactively participate in multilateral defense cooperation mechanisms within the ASEAN–led framework. Importance should be attached to cooperation in military medicine, search and rescue and non-traditional issues, to international treaties, agreements and mechanisms to manage/settle disputes and conflicts such as the Code of Conduct (COC) in the South China Sea, ASEAN Defense Ministers Meeting (ADMM) and ADMM-Plus, thereby widely popularizing Vietnam’s defense policy of peace and friendship. Proper preparations should be made for the dispatch of a level-2 field hospital to South Sudan and an engineering company to UN peacekeeping missions to go according to plan. The Master Plan for Defense Diplomacy 2020 should be completed in preparation for Vietnam’s ASEAN Chairmanship in 2020, including proposed themes for military/defense meetings, initiatives and road map for ADMM+ in 10 ensuing years’ time while infrastructure should be upgraded to be earmarked for defense diplomacy activities. Fifth, enhancing the effectiveness of border defense friendship exchange programs with Cambodia, Laos, China while embarking on those programs with other countries. A multilateral border cooperation framework should be established, with Cambodia, Laos and China to start with for the sake of shared borders of peace and friendship. A to-do list should include the 5th Vietnam – China border defense friendship exchange program, the border defense friendship exchange program between border guard forces of Vietnam, Laos, Cambodia, China, Myanmar and Thailand, sharing of experience in preventing cross-border crimes, hastening of Vietnam – Cambodia land border demarcation in 2018 on the basis of common perceptions of the Vietnamese and Cambodian leaders reached, the organization of Vietnam – Cambodia cross-border joint search-and –rescue exercises. 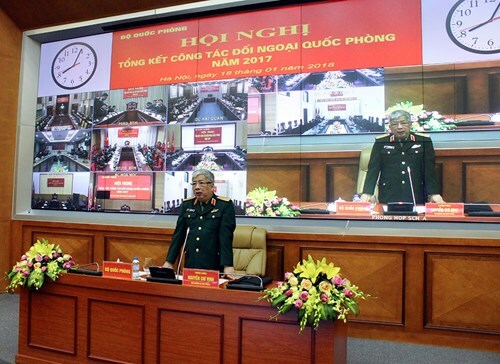 Hotlines should be established between Vietnam’s Ministry of National Defense and its foreign counterparts, between Vietnam’s maritime law enforcement agencies and their relevant foreign counterparts. Sixth, fostering international cooperation in war legacy issues. Dioxin clean-up programs in Bien Hoa airbase should be accelerated while increased support should be mustered for those exposed to dioxin. The effectiveness should be improved of mine and unexploded ordnance clearance left over from wars in provinces of Binh Dinh and Quang Nam. Importance should be attached to the enlistment of non-refundable aid for dealing with war legacy issues, including mine and unexploded ordnance clearance in provinces of Ha Giang, Quang Tri, etc. Seventh, improving the effectiveness of management and propagation when it comes to international military integration and defense diplomacy. Military-run enterprises’ diplomatic activities, which are subject to defense diplomacy agencies’ management, should be in line with the country’s master plan for bilateral relations, the law of Vietnam and host countries while guarding state and military secrets on the basis of effectiveness and thrift. Meanwhile, propagation should be effective, flexible and creative with diverse contents and forms. Emphasis should be placed on working visits by the leaders of the Party, the State and the military. Our Party has concluded from theory and practice that international military integration serves as a strategy for Homeland protection from afar by peaceful means. To this end, economic, political, cultural, military, security clout should be increased, thereby raising the country’s international status. Accordingly, the key role of agencies in charge of defense diplomacy should be further promoted while widespread participation by relevant agencies inside and outside the military should be encouraged. At the same time, public support should be maximized. All of these will certainly create synergy for the successful implementation of the Party’s resolutions and the Project on “International military integration until 2020 and vision till 2030”.